When I asked my Twitter and Facebook pals about their favourite cakes, I was not prepared for the deluge of replies. Everybody has an opinion on cake, apparently. Who knew? I have a handful of go-to cakes - the classic pound cake, upside-down caramel & pear spiced cake, lemon & raspberry meringue, Danish 'dream cake', and (the latest addition) chocolate and beetroot cake - but am always interested in expanding my repertoire. My good friend Liz makes a stunning, but super-easy, 'medieval' apple tart as well as the best lemon drizzle cake I have ever tasted. I need to try making both of those cakes. I have also sampled a take on Nigella's chocolate/guinness cake which I'd be interested in tweaking a tiny bit. Here's a recipe for one of my cakes. It is not vegan, it is not gluten-free, and it is not healthy - I'm not one of those bloggers (and I'm also not a food stylist as you can tell from the photo) - but it is really tasty. Prep the pears by pealing them, removing the grit and dividing them into quarters. Place them neatly in the greased cake tin. Melt sugar and butter in a saucepan. Watch the mixture closely as it'll turn to sticky, HOT caramel and you don't want to burn it (or yourself). Pour the caramel mixture on top of the pears. Sift together the dry ingredients in a large bowl: flour, baking powder, salt and spices. Mix the wet ingredients in another bowl: beaten egg, treacle, sugar, butter, and milk. Combine the wet & dry ingredients and beat until the mixture is smooth. Pour the battern on top of the pears and bake for approx 45 minutes. 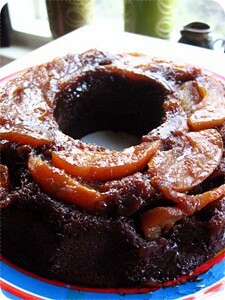 Test the centre of the cake with a knitting needle or other sharp, pointy implement. The needle should come out of the cake without anything sticking to it. This cake is extra good the next day. I'd usually serve it with honey-laced Greek yoghurt or creme fraiche, but it is also very good on its own. -- My baking soundtrack was courtesy of local indie pop band, Belle & Sebastian. If you ever wonder about my neighbourhood, go watch all their videos as they like to film them here in Glasgow's West End. This one, Wrapped Up in Books, was filmed in Caledonia Books just down the road from me. I sometimes worry that my life has become one long Belle & Sebastian video: bookish, arty girl wearing retro clothes around the West End and looking a bit twee in her handknits. Hmmm... worse things could happen. It is no secret that I love hanging out at Auntie M's Cake Lounge. Sadly it is the end of an era for a place that quickly became a West End classic with its effortless style, delicious homebaked goods and witty banter. 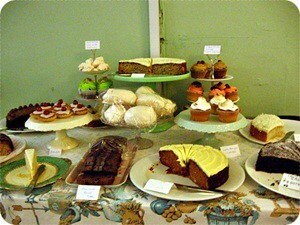 However, as befits its spirit, Auntie M is closing with a cake buffet and a week-long vintage craft supplies sale. Pictured: lemon layer cake, chocolate pound cake, peanut butter & chocolate cake, spice cake, banana cake, bakewell tarts, victoria sponge cupcakes, maltesers cake, coconut cake, orange cupcakes, coffee & caramel cupcake, mint meringues, lemon meringue cupcakes, chocolate cherry cupcakes and more. Other Half managed five slices of cake plus 3 cupcakes. Sadly I wasn't far behind. The vintage craft supplies sale is running for an entire week. If you are in Glasgow, I really urge you to go have a look. 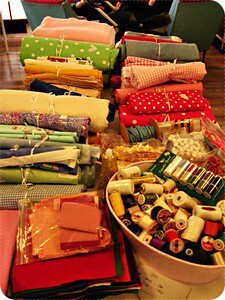 This is the fabric table full of vintage fabrics (remnants were underneath the table). Other tables had cross-stitch kits, trimmings, zips, notions, knitting patterns, buttons etc. You could even pick up a bargain sewing machine if you were so inclined. I bought a metre of really cute robin's egg-blue cotton with dancing mice - not my usual style, but rather fabulous all the same. I can see this working as a very cool quilt back. 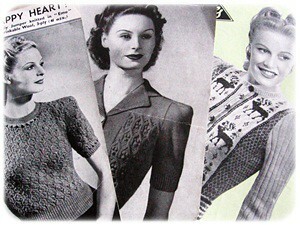 And I bought some fantastic vintage knitting patterns. 75p each! From the left: a very pretty 3ply jumper with a very intricate lace pattern and unusual crochet edgings; a 3ply cardigan with a lovely lace & bobble stitch pattern; and finally a spectacular cardigan with colourwork panels and reindeer intarsia panels. I fell in love immediately. The instructions are horrific though, as the reindeers are not charted but are written out stitch-by-stitch. I was chanting in my head: I love charts, I love charts, I love charts.. I shall miss Auntie M's a huge amount. It became a home-away-from-home of sorts and I shall especially miss the sparkling banter (and the lemon drizzle cake). On the other hand, my waistline is rather thankful that you are closing. Thank you for everything, Michelle and Sam. It has been an absolute blast. Certain times of the year are always more fun than others. I'm entering a really, really busy and really, really fun part of the working year for me - which may mean I won't be able to blog as much as I usually do. Having said that, it might also result in more blogging because I have many things buzzing about my head. Hmm. On a related note, a big thank you to supreme Swedish knitting e-zine and website, Stickamere, which is doing a KAL for my free fingerless gloves pattern, The Vicar's Fields. I'm looking forward to seeing what you all do with my pattern! Today I went to Edinburgh. It was an exceptionally beautiful day (Scotland is always exceedingly pretty in April. April and October) and I was lucky to lunch in a place with a most extraordinary view over Leith and the Firth of Forth. It all made for a good day away from Glasgow and I felt rejuvenated by good company, fine conversation, and post-work Danish pastries with Katherine. I also slipped in a post-work browse of the McAree Brothers' knitting shop close to The National Portrait Gallery. I had never been to McAree before but I actually left feeling very, very impressed by the shop. It does not have a big buzz about it - possibly because it does not stock fancy handdyed yarns or cool designers or does that elusive Ravelry vibe, but it does exactly what I want a LYS to do: it does depth. It has baskets upon baskets of seemingly random yarns, it is stocked to the rafters with workhorse yarns, and it has put an enormous amount of time and effort into its displays. It's not the sort of place which only does five balls of something when you really want three sweaters' worth. Even better, it has a wealth of long discontinued yarns hidden away in its Aladdin cave, so if you are the type of knitter who is always two balls short you just need to call the lovely McAree staff. And I have not even mentioned the great assortment of books or the knitting notions or the charming staff..
.. I actually left empty-handed (mostly because I'm drowning in yarn already) but anyone visiting Edinburgh should pop into this little LYS that can because it so clearly does care.You might not get unicorn yarn handdyed by elves in McAree, but you won't lack for everyday yarn and sometimes everyday yarn is exactly what the doctor ordered. Finally, I overheard this on Edinburgh's High Street (walking towards my Danish pastries): "In Melbourne you really do get four seasons in one day." Certain readers will know why that comment put a smile on my face..
.. and here's a song about sunshine on Leith (youtube link). I think I have gone native, dear readers, because this song is as Scottish as it gets and I love it in a terribly, terribly sentimental way. Tonight I'm a cooking an almost full-blown Danish Christmas dinner (only 'almost' because I'm only serving one type of meat). We decided to make this a tradition so every time we celebrate Christmas in the UK we get a Danish Christmas dinner a week later and vice versa. It's a new tradition, though, and it is the first time I'm cooking the dinner on my own. We are having duck breasts (scaled down from an entire duck) with two types of potato (boiled and sugar-glazed potatoes), braised red cabbage and duck gravy. Normally I would also serve roast pork but it is nigh impossible to get the correct cut here in Scotland unless you order it well in advance. For dessert I'm serving risalamande with hot cherry sauce. I bought the cherry sauce when I was in Denmark in November! Food is such an expat thing, I tell you. I never used to care so much about traditional Danish food as I do now. I saw tea rusks in my local supermarket today and could almost taste hot elderberry soup right there and then. Happy new year - happy Hogmanay - godt nytår! I'm off to try and balance four pots cooking at the same time..